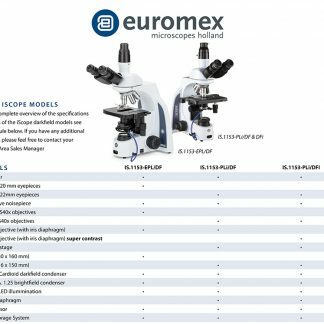 From the Dutch microscope manufacturer Euromex, this is a good entry-level microscope. 10 years manufacturer warranty. 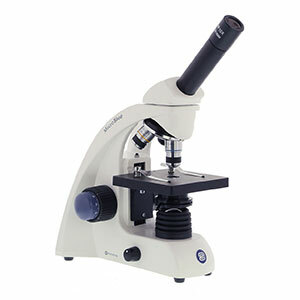 The trinocular head means it is much more convenient to link a camera to the microscope to take photos for measuring software (such as the excellent Piximetre). 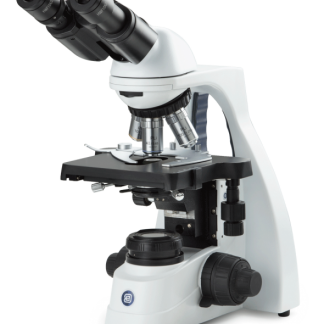 Tube Trinocular head with 30 inclined tube, fully rotatable over 360. Tube length 160 mm. SPL 4x N.A.0.10, SPL 10x N.A.0.25, SPL S40x N.A.0.65 and PL S100x N.A.1.25, oil-immersion. The 40x, 60x and 100x objectives are spring-mounted. Focus control by means of coaxial coarse and fine adjustment knobs; fine adjustment knob is graduated for 0.002 mm per interval Stage Large mechanical stage, 120 x 135 mm, ball-bearing mechanism, with X and Y adjustment 75 x 35 mm. Double nonius, readable in 0.1 mm. Detachable slide holder.